All employees had been creating their own email signatures, which were not in keeping with the organization’s brand guidelines and QMS protocols. This was causing concerns that die Kurbel’s brand reputation was being affected. die Kurbel - Katholisches Jugendwerk Oberhausen gGmbH is a Catholic youth organization located in Oberhausen in the Ruhr area of Germany. A provider of various social projects and activities, the organization has a founding mandate to help children and teenagers with all aspects of their personal development. By doing this, the organization helps provide the skills that will serve them best in adult life. It maintains close ties with Oberhausen schools, job agencies, the city’s government, local churches and a variety of other businesses, giving it a reputation that is unmatched throughout the region. Every business has ‘an image’ that it will often spend large sums of money on designing and maintaining. This will include logos, business cards, fonts and even characters to draw attention to the brand so that it stands out from other organizations and has a unique identity. At die Kurbel, Quality Management System (QMS) procedures had been implemented to ensure that all communications used consistent corporate branding. However, with emails, the most common form of communication between clients and prospects, the brand was often left in the hands of each email sender. This meant that individual employees would create their own email signatures, without any thought as to how these designs would represent die Kurbel as a whole. With so many different signatures being used, there were genuine concerns by senior management that these were reflecting negatively on the organization’s brand reputation. Also, by letting employees create their own email signatures, all QMS procedures were being completely ignored, which was simply not acceptable. It was decided that it would take up too much IT resource to update all employee email signatures manually and there was no way to effectively manage this process in-house. Therefore, the IT department felt that the best approach was to find a solution that would centrally manage all organizational email signatures without the hassle of visiting every workstation and performing manual updates. We opted for Signature Manager Outlook Edition as it was the best software available for centrally managing and producing uniform email signatures. Tasked by senior management to come up with an answer to this problem, the die Kurbel IT department started to research what email signature software solutions were available. 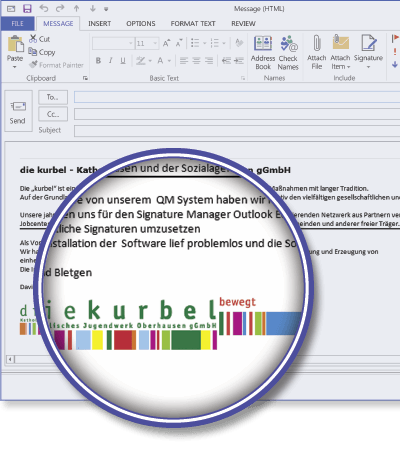 Finding Signature Manager Outlook Edition online, David Bletgen, System Administrator at die Kurbel, decided to contact Exclaimer directly to learn more about the capabilities of the product. After a comprehensive demonstration, he downloaded a 30-day trial version to test the software within the die Kurbel IT environment to ascertain if it would solve the organization’s email signature issues. He soon realized the software would do everything he needed it to and more. “Signature Manager Outlook Edition gave our IT department centralized management of all email signatures for the first time,” said Mr Bletgen when asked for further details. “We could create one signature for all employees and easily distribute it from one workstation. It didn’t cause any service disruption and we had deployed the new signature within 30 minutes of the initial download.” He then went on to mention how easy the software was to use by highlighting how he felt it could be run by someone with no specialist IT skills. With Signature Manager Outlook Edition deployed, the die Kurbel IT department solved a serious issue in a quick and efficient manner. There is now no need for employees to create their own email signatures and it is easy to set up signature updates as and when they are required. There is also the added bonus that IT saved many precious man-hours by not having to update signatures manually at every employee’s machine. “Now that all employees have the same email signature, we no longer have to worry about brand inconsistencies on corporate correspondence,” finalized Mr Bletgen. “The die Kurbel brand is an important part of the organization’s reputation, so it’s safe to say that management are very happy with Signature Manager Outlook Edition. I personally think Exclaimer is a fantastic company to work with and I would recommend its software to anyone!